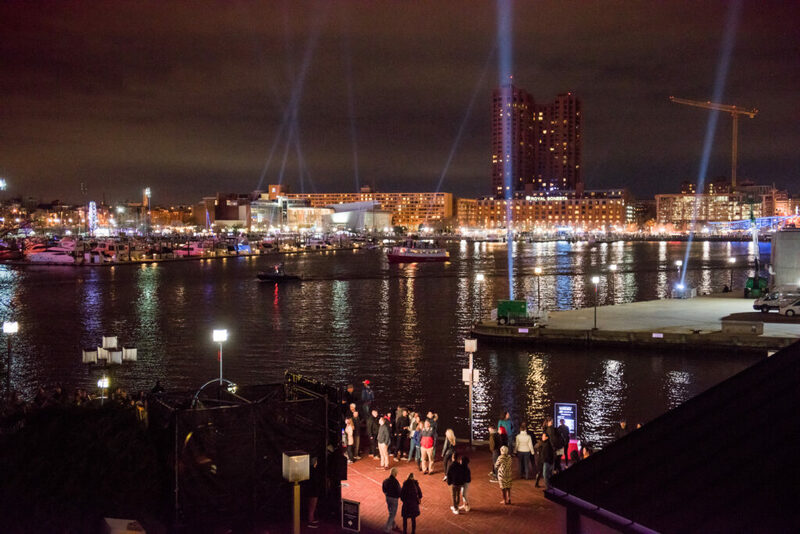 Baltimore’s second annual Light City festival featured numerous vibrant art installations and performances by UMBC faculty, students, staff, and alumni, as well as thought-provoking talks by UMBC researchers during the Labs@LightCity companion innovation conferences. Interactive artworks by Eric Dyer, associate professor of visual arts, and Timothy Nohe, professor of visual arts and director of the Center for Innovative Research in the Creative Arts, drew crowds throughout the festival week, March 31 – April 8. Dyer discussed his piece, “Shabamanetica,” with the Baltimore Sun just ahead of Light City, and Voice of America featured Nohe’s work in story recapping highlights from the festival [see video at 1:30]. A sneak peek of the UMBC SPARK pop-up gallery drew a crowd on its opening night, and audiences throughout the week, for installations by several UMBC faculty and students and performances by UMBC’s Baltimore Dance Project, percussion ensemble, and others, as well as an animation workshop by Corrie Parks, assistant professor of visual arts. 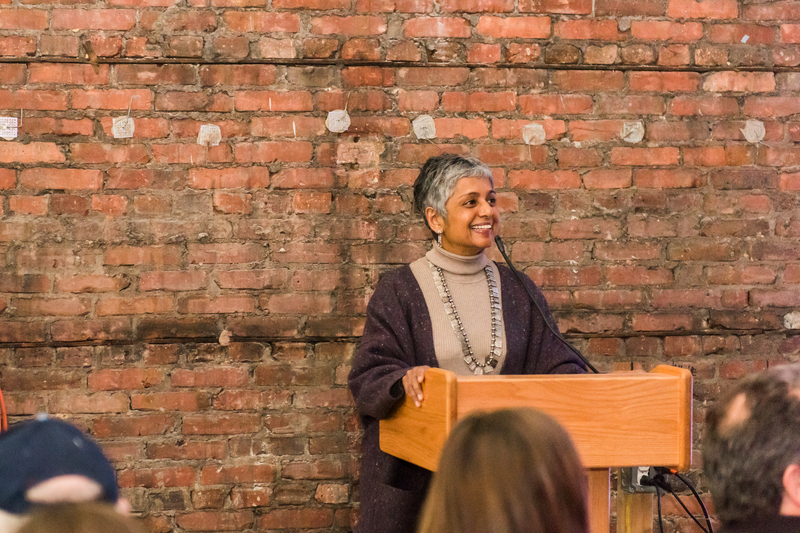 Preminda Jacob, chair and associate professor of visual arts, speaks at the SPARK gallery. The Black and Gold Lounge was also a major draw throughout the evening on Saturday, April 1, as the UMBC community gathered, with family and friends, to enjoy a 180-degree panoramic view of Light City, right on the path of the BGE Art Walk. View of Baltimore’s Inner Harbor from the Black and Gold Lounge. Light City’s HealthLab on April 3 featured Gymama Slaughter, associate professor of computer science and electrical engineering. Slaughter works to develop biosensors that are powered by the human body and do not require batteries. Her talk, “The Body as a Battery,” focused on how the body’s chemical energy can be channeled to power wearable and implantable medical devices. 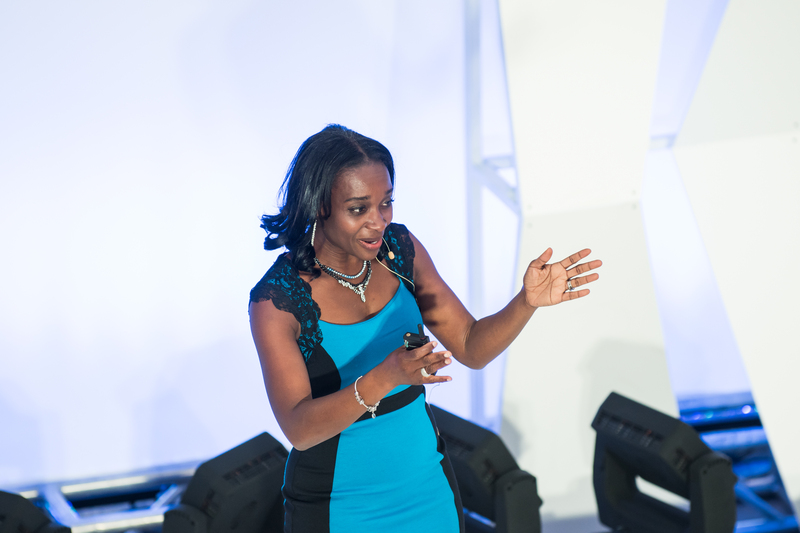 Gymama Slaughter speaking at Light City’s HealthLab. Slaughter’s work examines novel ways to use the human body’s natural ability “to reboot and recharge your energy reservoir” by eating food and breaking it down. “What we’re doing in my lab is taking energy-rich blood sugar and converting it into electricity to power implantable devices such as the pacemaker, or wearable devices such as the continuous glucose monitor,” she explained. Current technologies are dependent on battery power, and failing to recharge or replace batteries when needed can pose health risks. Creating devices that utilize the body’s own energy reservoir could remove those risks and also “allow us to eliminate repeated surgery” for battery replacement. The following day, Chris Swan, professor of geography and environmental systems, shared his perspective on the GreenLab panel, “New Thinking: Greening Baltimore at the Grassroots.” Swan’s research over the past six years has focused on re-greening vacant lots in Baltimore with native species. He asks cutting-edge ecological questions, and at the same time, works with communities to improve the health and safety of underserved Baltimore neighborhoods. 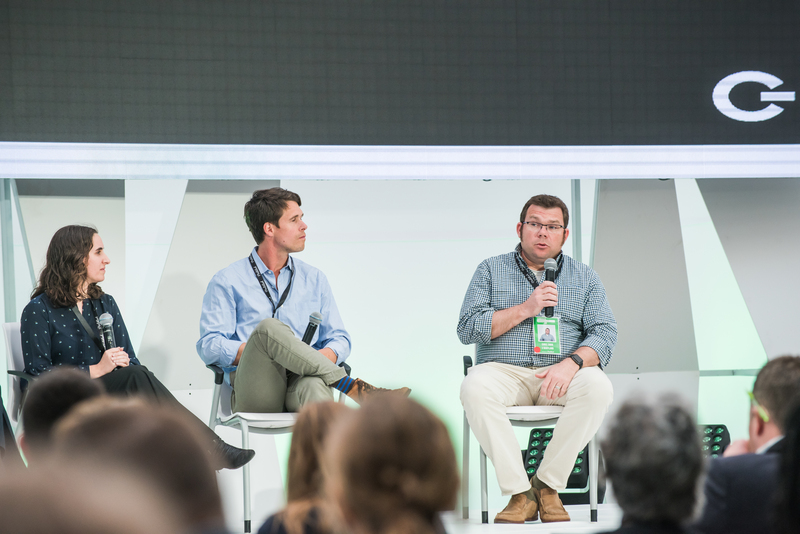 Chris Swan (r) speaking at Light City’s GreenLab. “We were very surprised at how quickly we got results,” Swan said, noting that robust populations of native plants, pollinators, and other wildlife returned within two years of the start of the study, despite terrible soil conditions. Following this success, his project is now expanding from an original 25 lots to nearly 100. Swan also shared his previous collaborative work with incarcerated men in Baltimore. “We had master gardeners providing education to inmates about how to do urban agriculture,” he detailed, describing how the inmates were able to contribute to the ecological research and gained useful gardening skills they could leverage after their release. Based on his experiences with creative partnerships, Swan is optimistic about the future of Baltimore. “There’s tons of potential,” he says, in all kinds of areas. 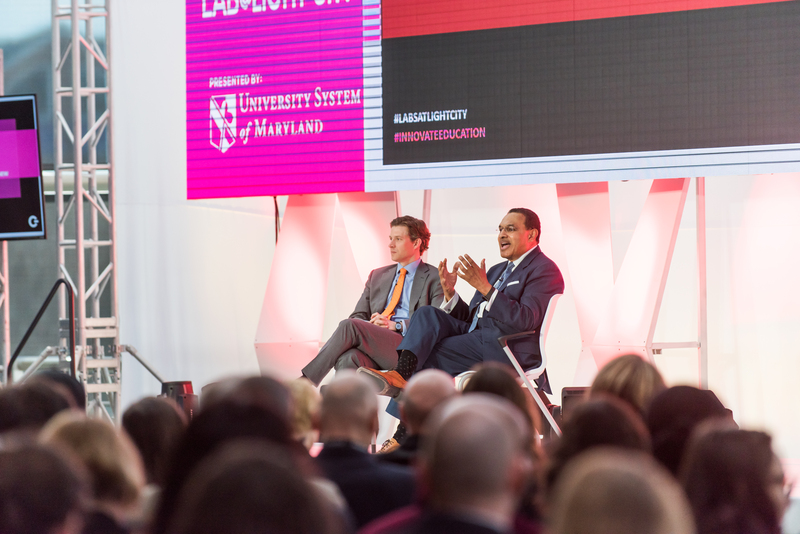 On April 5, President Freeman Hrabowski kicked off Light City’s EduLab in a conversation with Johns Hopkins University-affiliated entrepreneur Alec Ross titled “The Path to the Future.” President Hrabowski discussed what education might look like in the years ahead, emphasizing the interconnections among different fields, the increasingly prominent role of data and data science, and the possibility of more personalized education pathways. President Freeman Hrabowski (r) at Light City’s EduLab. Hrabowski particularly emphasized the need for students to embrace both STEM and the humanities. “We have to get away from thinking some kids are going to be good at math and science, and some kids are good at history, arts, and English,” he said. “I want everyone in the room thinking about how we teach young people and ourselves to connect both with the humanities and with the technology side.” Why? Careers of the future will require skills in many areas, not one narrow topic, Hrabowski suggested. Plus, he shared, even in fields they find initially challenging, “students can learn much more than they think,” and knowledge across disciplines can expand the possibilities for their futures. Light City, with its artworks inspired by technology and society, and talks by experts across a diversity of fields, gave visitors a glimpse of that future. Header image: Eric Dyer with his piece “Shabamanetica” at Light City 2017. All photos by Marlayna Demond ’11 for UMBC.